Dry heat self-seal sterilization pouches that are transparent in color. These self-sealing pouches are made from a nylon material and have dry-heat sterilization compatibility. Notched for ease of opening after processing, and complimentary external chemical indicator labels are included. Nylon material is clear, strong, and puncture-resistant, maintaining a durable barrier for instrumentation until point of use. 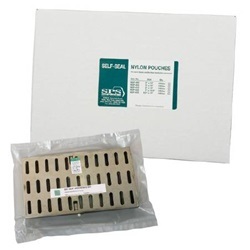 Nylon packaging products are manufactured for use with dry heat processes up to 420°F. Includes built-in adhesive tape, which eliminates the need for a heat sealer or indicator tape. Sold 100 per box. 4" x 10" sterilization pouch. 3" x 10" sterilization pouch. 7" x 10.5" sterilization pouch. 9.5" x 13" sterilization pouch. 2" x 10" sterilization pouch.